D Cast releases the single, "I'm a Beautiful Mess," supporting the staff and volunteers at the East Los Angeles Women's Center. Los Angeles, CA, April 02, 2019 --(PR.com)-- D Cast of DCast Music releases his unplugged and raw debut single, “I’m a Beautiful Mess.” Featuring just the artist and his guitar, the song was recorded live in a single take, with no additional editing. This format was explicitly chosen to celebrate life in its authentic form - unproduced and unedited - rather than following in the footsteps of the overproduced and over-edited media pervading our daily lives. Domestic violence awareness is also a cause that D Cast cares for. Therefore, the single will support organizations that help survivors of domestic violence and sexual assault. Violence against women continues to be a severe problem in our society, and D Cast knows firsthand how much support they need. By donating the single’s proceeds, D Cast seeks to not only raise awareness about the existence of these organizations but also to highlight the vital services they provide to some of the most vulnerable members of our society. Half of the proceeds will be donated to the East Los Angeles Women's Center to empower and support the staff and volunteers that help those in need every day. The Center offers assistance 24 hours a day and provides critical services such as emergency shelter, counseling, food and clothing, advocacy, and even legal counseling. 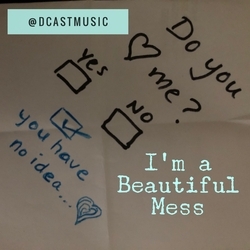 “I’m a Beautiful Mess” will be available on all major music platforms and it can also be purchased directly from D Cast’s site at dcastmusic.com. Support the movement that celebrates humanity in its pure unscripted form. More importantly, support organizations that aid women that are in desperate need of care.